When it comes to network security, we use firewalls for perimeter defense. It helps to define security boundaries for infrastructure. There are many conversations about validity of perimeter defense against modern security threats as its more about identities now. However, firewall is still the most commonly used tool to control in & out communications in a network. In Azure so far, we were using Azure Network Security Groups or host firewall to filter network traffic. 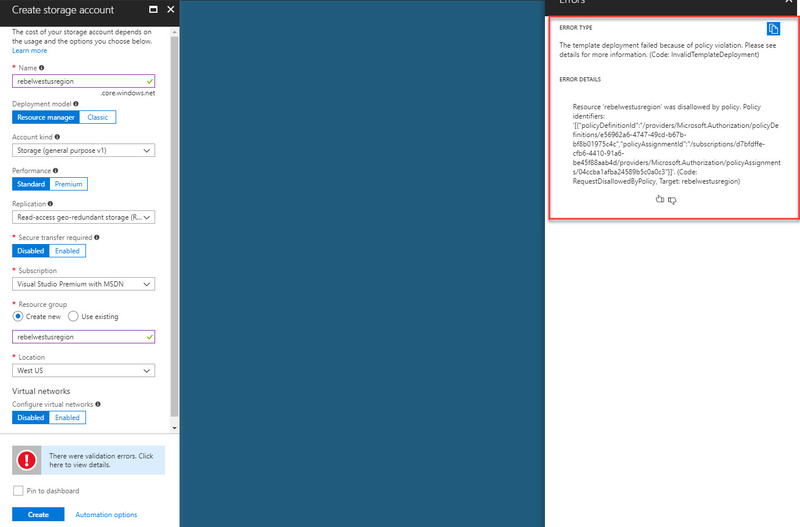 But now Azure Firewall allow to filter traffic pass through Azure Virtual Networks. It works as fully stateful firewall. It is still in preview mode but it is not too early to test its capabilities. • Built-in High Availability – Firewall manages ingress and egress traffic of the network. So high-availability of edge firewall of your network is really important. Azure firewall is a cloud-based service and comes with built-in high availability. Users do not have to pay or do additional configurations for HA. • Domain Based Filtering – Traditional Firewall rules are based on IP addresses. We have to define the networks to allow or deny access. Azure firewall can block or allow access based on FQDN. It is also supported to use wild cards. • Work as fully stateful firewall – Azure firewall allow to create inbound & outbound rules using networks, FQDN, protocols & ports. So, it can monitor nature of active connections and allow or deny relevant packets through firewall. • Outbound Source Network Address Translation (SNAT) – All outgoing traffic from virtual networks are translated in to Azure Firewall Public IP Address. It allows to identify and control traffic leaving from your network to other destinations. • Azure Monitor Integrations – All Firewall events are logged in to Azure monitor. If required we can send it to log analytics for further analysis. • No need to worry about upgrades – If it is hardware firewall, it has its own capacity limitation. It can be based on port utilization, ram or packet processing power. Since azure firewall is cloud-based service, none of those limitations applies to it. it can scale up whenever it needed. Current license model for this service is based on size of traffic (of ingress & egress) travel through virtual network. As it is still on preview mode, it doesn’t come with any SLA. Therefore, do not use it in your production environment. Also, it has some know issues. You can read about those using https://docs.microsoft.com/en-gb/azure/firewall/overview . In this demo I am going to setup azure firewall and test it using few rules. • Keys saved in vault will be served via URLs. Developers, engineers do not need worry about securing keys. Application or service do not see the keys as vault service process behalf of them. • Customers do not have to disclosure their keys to vendors or service providers. They can manage their own keys and allow to access those keys via urls in vendor or service provider applications. Vendor or service providers will not see the keys. • By design Microsoft can’t extract or see customer keys. So, its further protected in vendor level too. • HSMs are FIPS 140-2 Level 2 validated. So, any industry required to comply with these standards are protected by default. • Key usage details are logged. So, you know what’s happening with your keys. 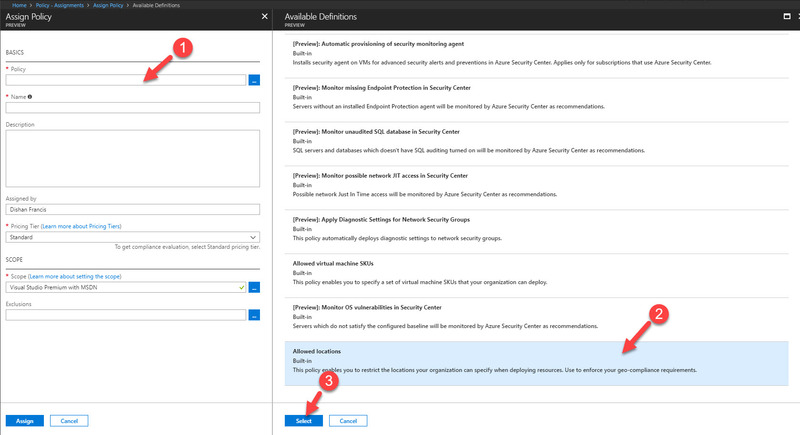 Let’s go ahead and see how we can setup and use Azure Key Vault service. 1) Log in to Azure Portal as global admin. 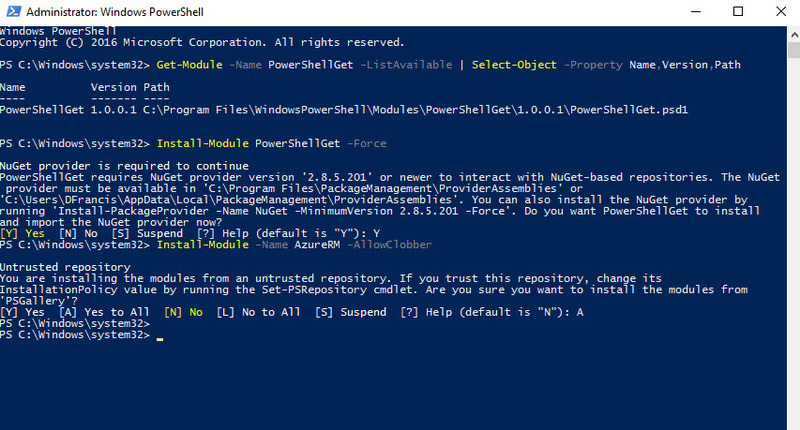 3) Then select PowerShell for the command type. 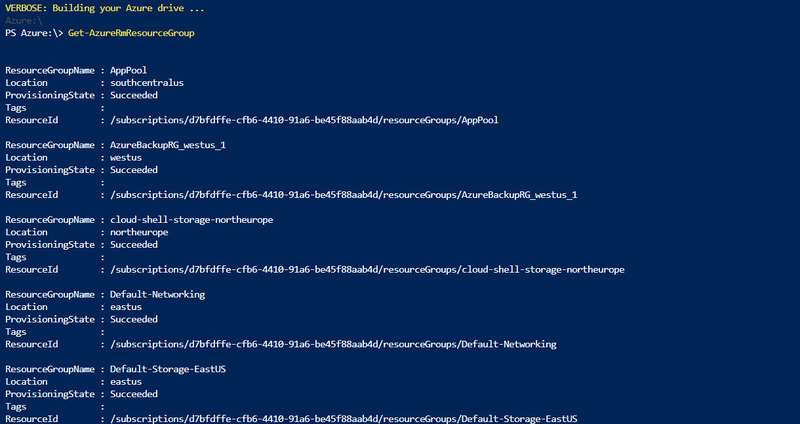 4) Then type Get-AzureRmResourceGroup to list down resource groups. So, we can select the resource group to associate the new key vault. In above VaultName defines the Key Vault name. ResourceGroupName defines the resource group it is associated with. Location defines the location of resource. In above Rebel-KVault1 is the key vault name. Vault URI shows the URL which can use to access the key vault by applications and services. 8) Next step is to create Access Policy for the key vault. Using access policy we can define who have control over key vault, what they can do inside key vault and also what a application or service can do with it. 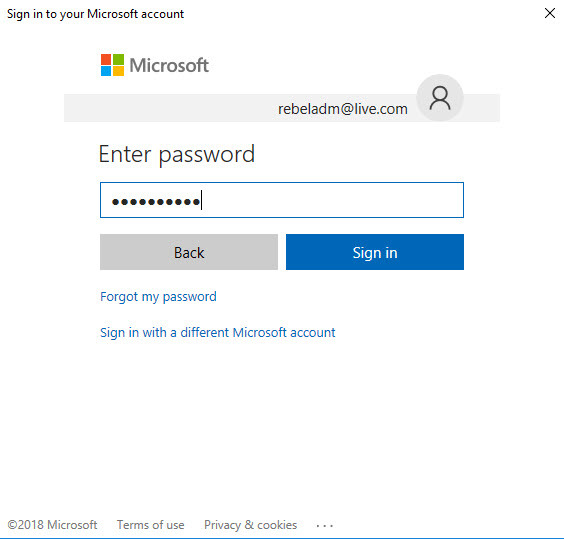 In above command, user1@rebeladmlive.onmicrosoft.com can create,delete,list keys in Rebel-KVault1. He also can set,list,delete secrets under same vault. We also can set permissions for application to retrieve secrets or keys. In above, service running on http://crm.rebeladmin.com will have permissions to retrieve secrets from the vault. 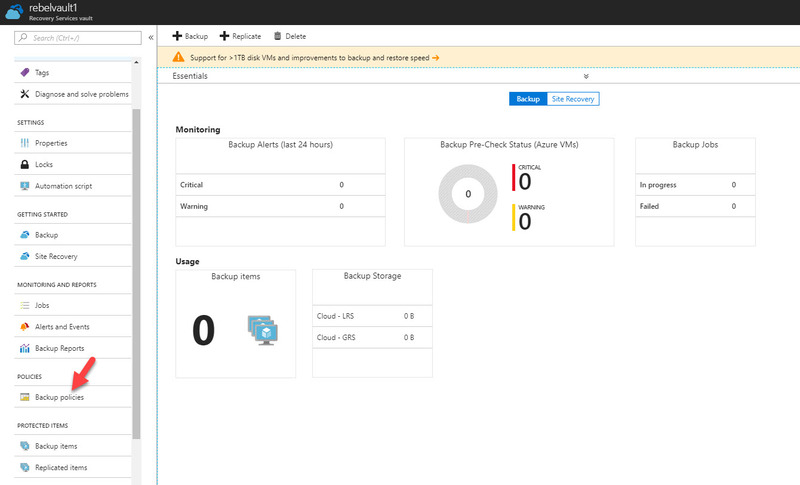 Azure Backup is capable of replacing typical on-premises backup solutions. It is cloud-based, secure, reliable solution. It has four components which can use to backup different types of data. 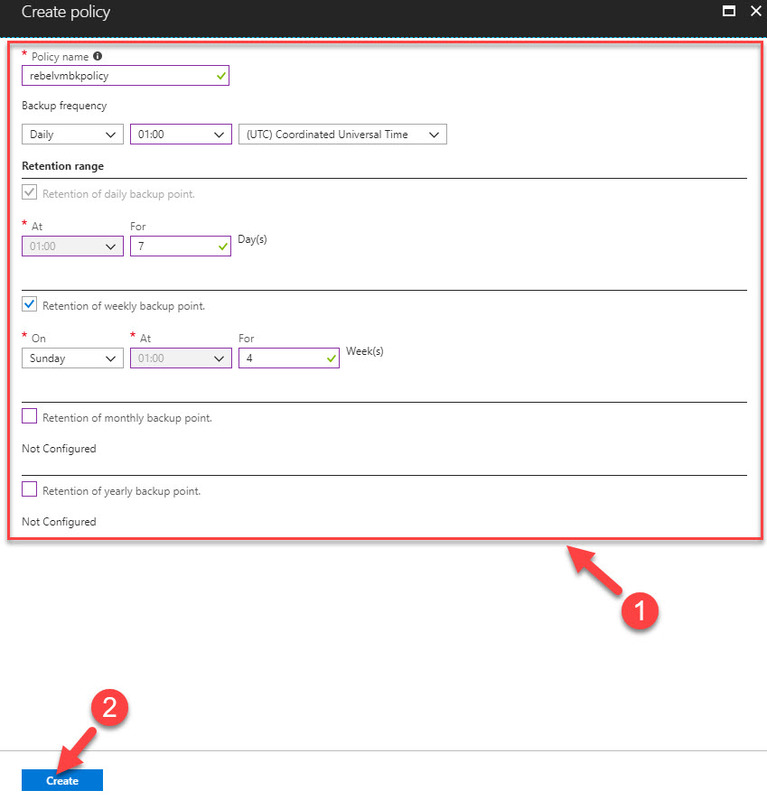 In this article we are going to look in to Azure VM backup (Azure IaaS VM Backup). How Azure VM Backup works? Azure VM backup doesn’t need any special agent installed in VM. It also does not need to have any additional components (backup server) install either to enable backup. When very first backup job is triggered, it installs backup extension inside the VM. If its Windows VM, it installs VMSnapshot extension and if its Linux VM, it installs VMSnapshotLinux extension. VM must be in running state in order to install extension. 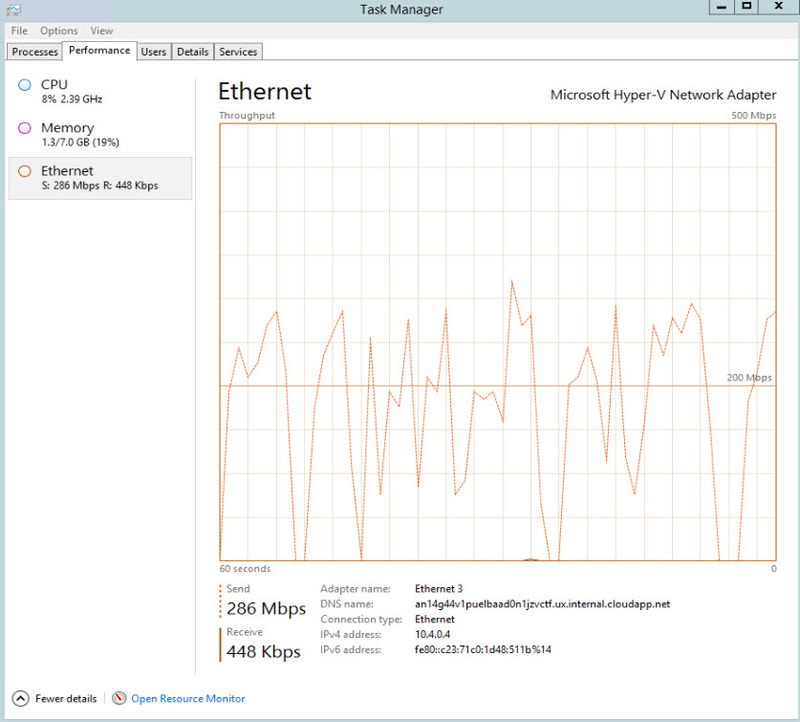 After extension in place, it takes point-in-time snapshot of the VM. If VM is not running during backup window, it takes snapshot of VM storage. If its windows VM, backup service uses Volume Shadow Copy Service (VSS) to get consistence snapshot of VM disk. If its Linux VM, users can create custom scripts to run before and after backup job to keep application consistency. Once snapshot is taken it will transfer to the backup vault. Service can identify the recent changes and only transfer the block of data which changed from last backup. Once the data transfer completes snapshot will removed and recovery point will be created. 1) Do not schedule more than 40 VMs to backup same time. 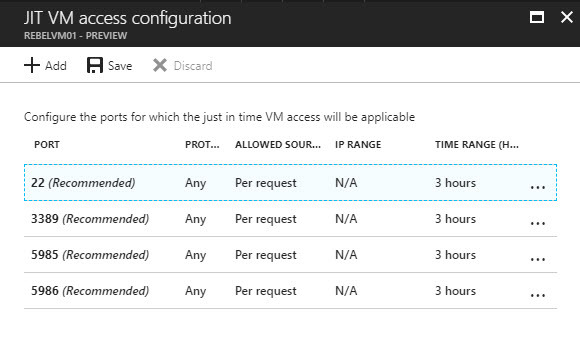 2) Schedule VMs backup when minimum IOPs been used in your environment (In relevant storage accounts). 3) Better not to back up more than 20 disks in single storage account. 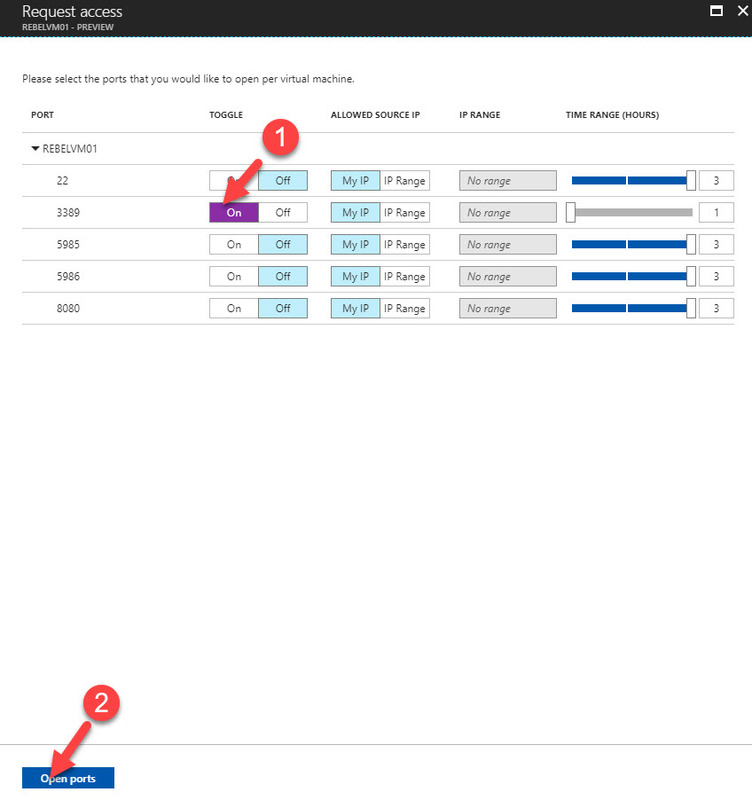 If you have more than 20 disks in single storage account spread those VMs across the multiple policies to maintain required IOPS. 4) Do not restore a VM running on Premium storage to same storage account. Also try to avoid restore while backup process is running on same storage account. 5) For Premium VM backup, ensure that storage account that hosts premium disks has at least 50% free space for staging snapshot for a successful backup. 6) Linux VM needs python 2.7 enabled for backup. Next step is to see this in action. 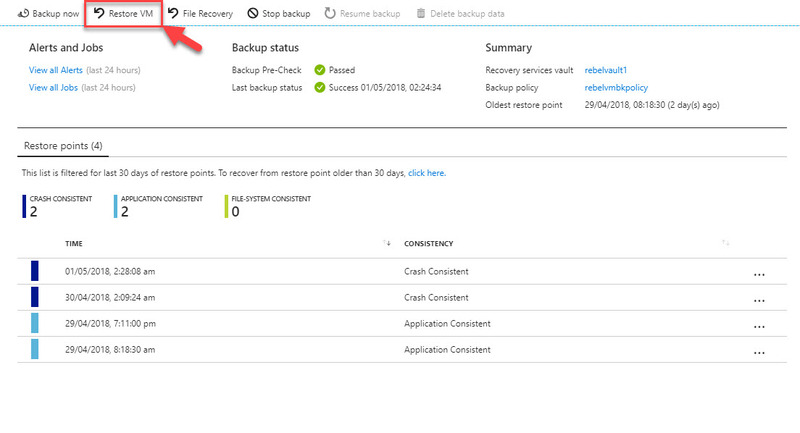 2) First step is to create Azure Recovery Service Vault. In order to do that, go to All Services and click on Recovery Service vaults under storage section. 4) It will open up wizard and there provide vault name, subscription, resource group and location. Once done, click on Create. 5) Now we have vault created, next step is to create backup policy. To do that click on vault we just created from the Recovery service vault window. 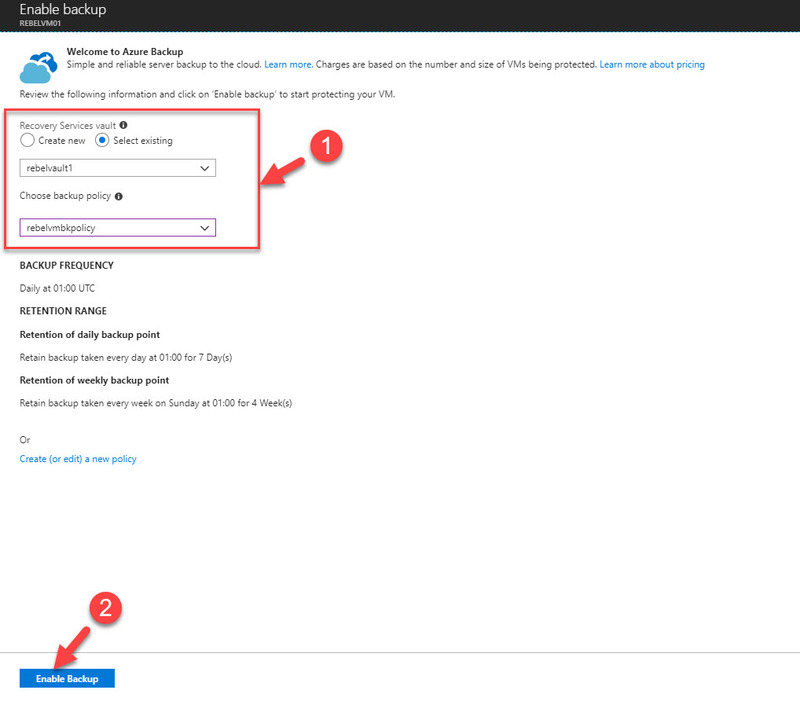 7) There is default policy from Azure VM backup. It backup VMs daily and keep it for 30 days. 8) I am going to create new policy to do backup every day at 01:00 am and keep it for 7 days. To do that click on add option in policy window. 10) In next window we can define time and retention period of data. Once done with the details click on Create. 15) Once backup jobs completed we can see the status of it in same backup window. 16) To test the restore I installed Acrobat Reader in this server and created test folder in desktop. 18) In next window it asks which backup to restore. I am selecting back up from 3 days. 20) Once selection is done click on Restore to begin the process. 21) We also can check the status of the job using backup job window. 22) Once restore completed, I can see a new VM. 23) Once log in to the VM I can’t see the folder and application I installed, as expected. In above it created an Azure Load balancer and TCP port 80 been load balanced among 4 instances. 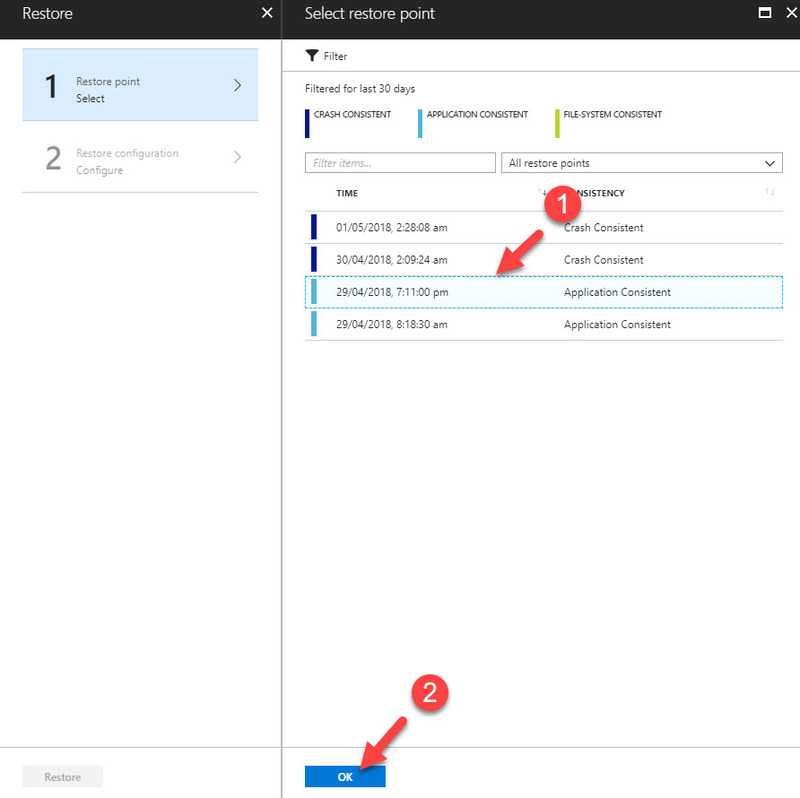 Under Azure Load Balancer | Inbound NAT rules it does have default rules for port 3389 and 5985. Those ports are mapped to custom TCP ports in order to give external access. As an example, in above sample, I can RDP to instance0 using 52.237.8.186:50000. Likewise, we can connect to each instance and install apps if need. instead of that we can use centralized remote deployment, so the configuration is same across the instance. In order to push application, first need to prepare app config. in my demo I got a file in GitHub repository. 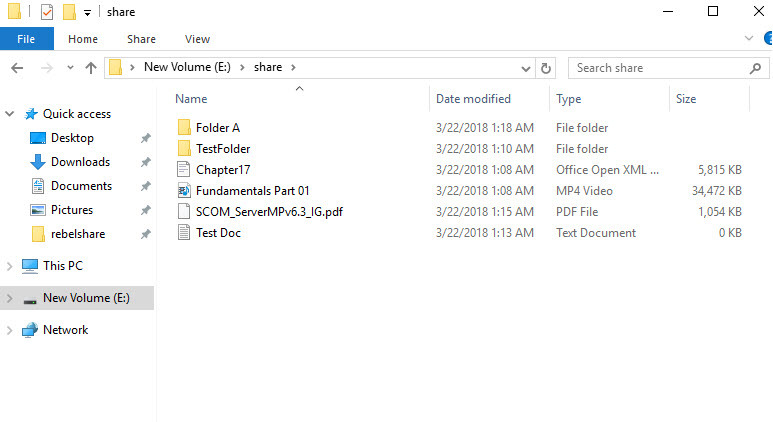 "commandToExecute" = "powershell -ExecutionPolicy Unrestricted -File simplewebapp.ps1"
Set-Content -Path "C:\inetpub\wwwroot\Default.htm" -Value "Test webapp running on host $($env:computername) !" It will install IIS and then create HTML file which will print text with the instance name. –Type specify the extension type. we can use Get-AzureRmVMExtensionImageType find the extension type. –TypeHandlerVersion specify the extension version. 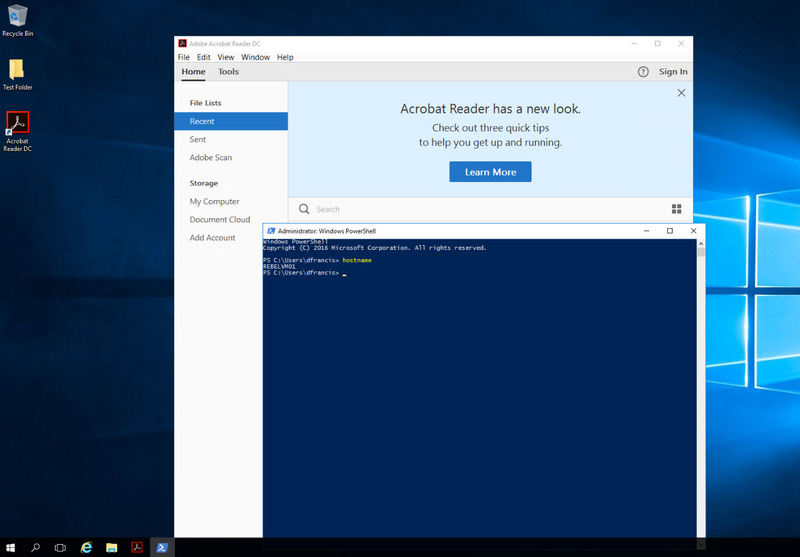 It can view using Get-AzureRmVMExtensionImage. Now it is time to do testing. Let’s go to public IP address and see if it’s got the app we submit. As I refresh we can see the instance number get updated. That means script is successfully running on scale set as expected. Every business has different regulations, compliances that they need to comply with. These regulations and compliances are different from one industry to another. As an example, if its financial institute they will need to comply with PCI (Payment Card Industry Data Security Standard), if it’s a healthcare service they will need to comply with HIPPA (Health Insurance Portability and Accountability Act). Some of these compliances are must to comply and some will just add extra value to business. ISO certifications are good example for that. Some of these regulations and compliances are directly apply to computer infrastructures as well. Especially related to data protection and data governance. Apart from that most business has their own “Policies” to protect data and workloads in their infrastructures. Most of the time end goal of these policies is to make sure if “IT department” done their part to support business compliance requirements. 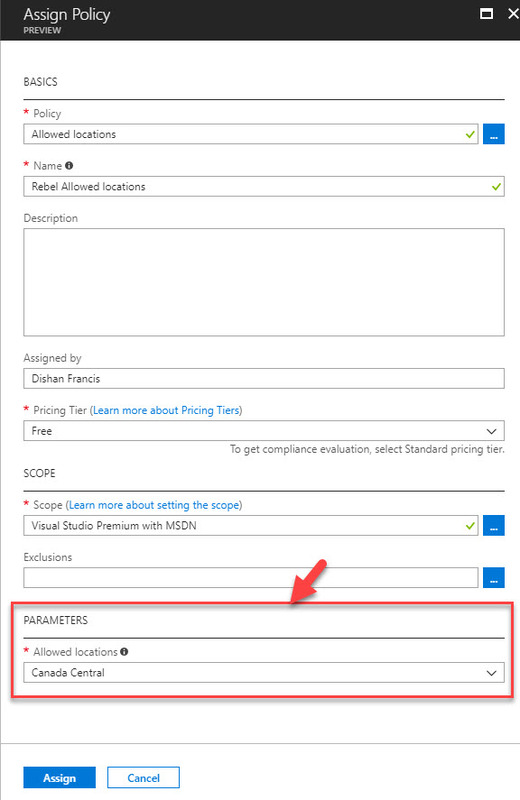 There are two great tools available from Microsoft to make it easier for enterprises to reach their corporate compliance requirements with in Azure environments. 2. 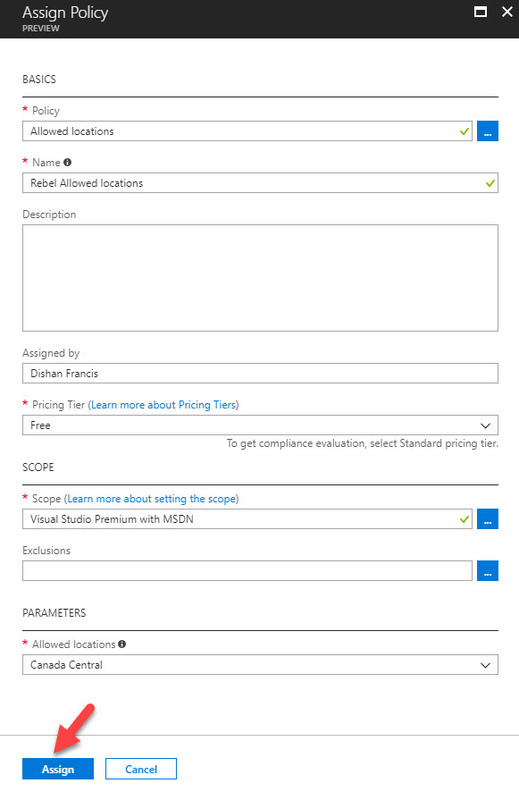 Azure Policy – This is more to review continues compliance in corporate infrastructure policies. As an example, a corporate need to make sure all their Azure resources are deployed under west us region. With help of Azure policy, we can continuously monitor resources and make sure it does stay compliance with that policy. in event of breach it will flag it up as well. In this post we are going to look in to Azure Policies and how it can help. Azure Policy does have 34 inbuilt policy definitions (at the time this article written). 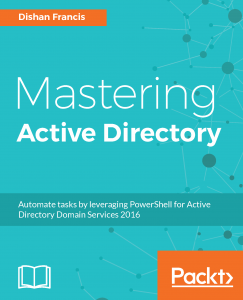 These are covering most infrastructure Management, Audit, and security requirements. Users can use these inbuilt policies or build their own. 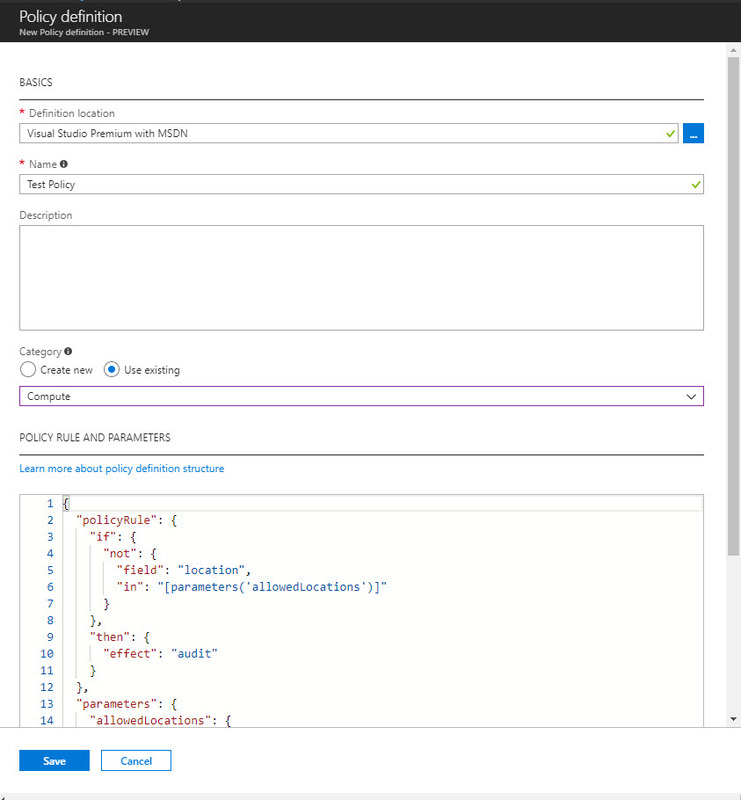 Azure Policy definition are JSON based. Each policy has following elements. This is to define the resource type considered in the policy. There are two modes can use in a policy. If you work with programming language or PowerShell I am sure you already know what parameter is. In here also it’s the same meaning. Parameter is special kind of variable which refer to piece of data. It simply the policy by reducing code. Following is extracted from a policy to show the parameter usage. It is just to identify the policy. description also can use to add more meaning. In above example, Approved VM images is policy display name and This policy governs the approved VM images is policy description. It’s the heart of the policy. it is where it describes the policy using logical operators, conditions and effect. Under the policy rule following logical operators are supported. In above example, it uses if, not and then policy blocks been used. It checks images id of virtual machines and if it’s not matching it will deny request based on effect. 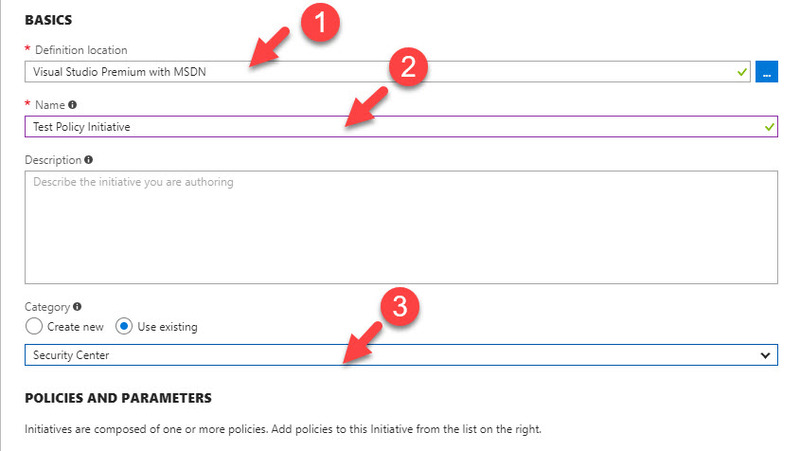 Azure Policy also allows to group policies together and apply it one scope. This is called Policy Initiative. This reduce the complexity of policy assignment. As an example, we can create policy initiative called “Infrastructure Security” and include all infrastructure security related policies to it. 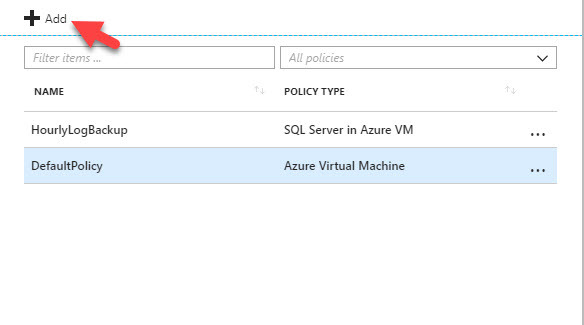 Let’s see how we can use Azure Policy feature. 2. Go to All Services and type Policy then click on policy tile. 3. Then it will open up the feature tile. 6. 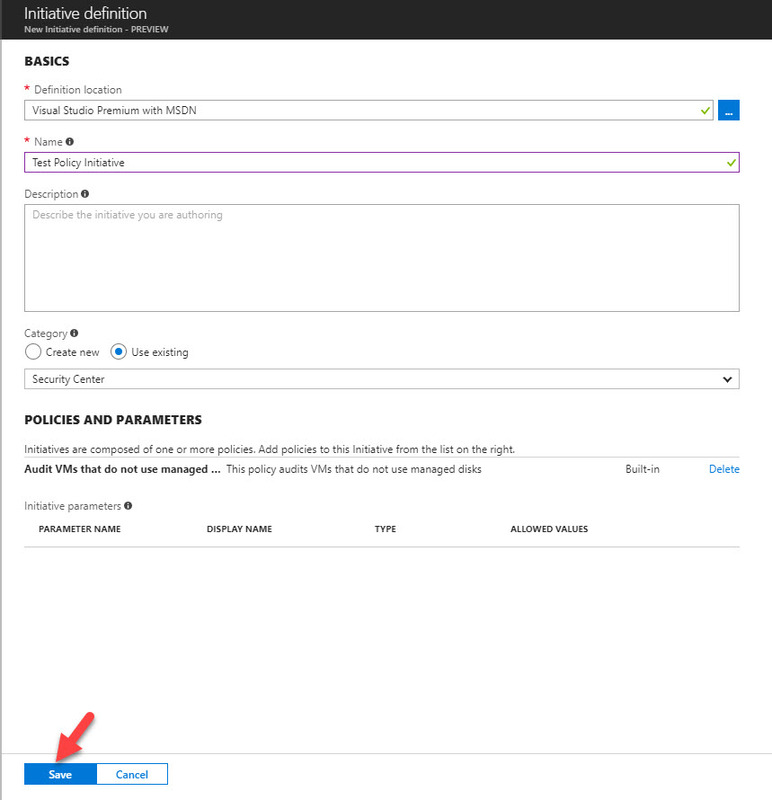 Then in it will open up Assign Policy Wizard. Click on Policy to list and select the relevant policy. in my demo I am using policy called “Allowed Locations”. Select the policy from list and then click on select to complete the action. 7. Under Name and Description fields define policy name and description which explain its characteristics. 8. Under the Pricing Tier select the pricing tier for evaluation. 9. Scope field defines the scope of the policy. it will be subscription in use. 10. Using exclusion, we can exclude resource groups which not going to exclude from the policy. in this demo I am not going to exclude any. 11. Then under the Parameters I select the region I like to use for my resources (In my demo I am using Canada Central as the region). 12. At the end click on Assign to complete the policy assignment process. Cool ha? It’s doing the job it supposed to do. Since policy effect is “deny” it should deny my request to create resource under other regions. Assigning Initiative is same process as Policy assignment. But before do that you need initiative in place. There is only one in-built initiative in place currently. 4. After that click on Initiative definition option. 5. in new window to start with, select Definition location. This is basically the targeted subscription. 6. Under Name, define name for policy initiative. 7. Under the category, you can either create new category or select existing one. 8. After that click on available policy in left hand panel and click on Add it to initiative. 9. Once it’s all done, click on Save to complete to process. Creating new policy is similar to creating initiative process. I can be done using Definition | Policy Definition option. Apart from that, using compliance option we can see the overall policy and initiative compliant status. It also allows to assign policies and initiative. This marks the end of this blog post. Hope it was useful for you. If you have any questions feel free to contact me on rebeladm@live.com also follow me on twitter @rebeladm to get updates about new blog posts. 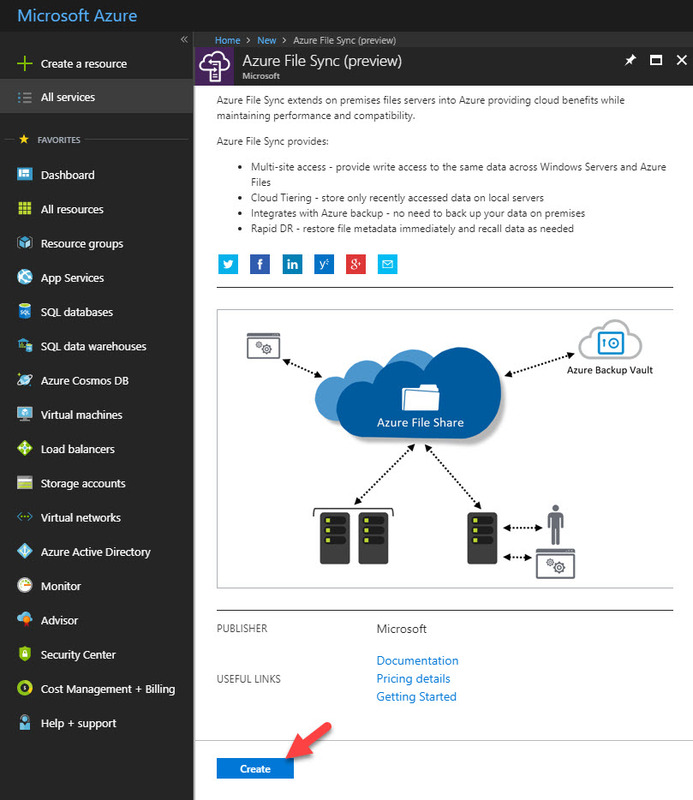 With Azure File Sync we can make on-premises windows server to act as a cache copy holder for your Azure file share. It allows users to access files locally using protocol such as SMB, NFS and FTPS. In this blog we going to look in to Azure file sync implementation. Before we start configuration, we need to familiarizes with some terms associated with this feature. 1. 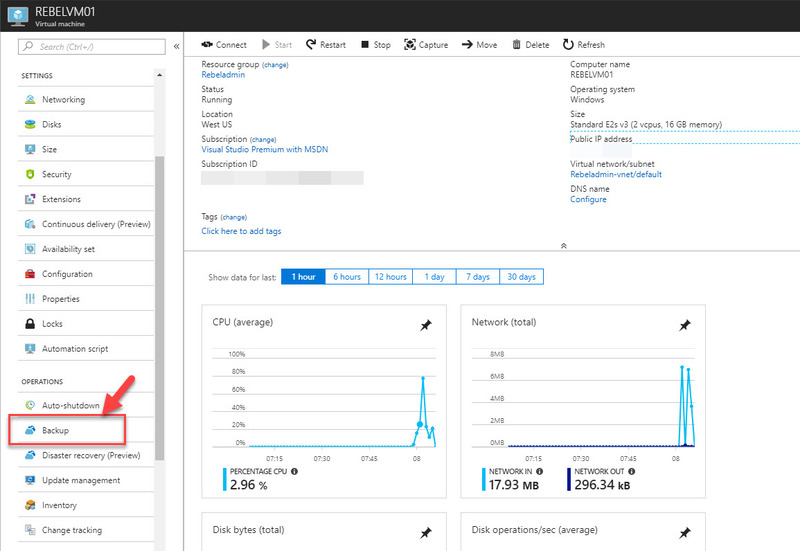 FileSyncSvc.exe – This is the service responsible for monitoring changes in local server initiate sync with Azure file share. 2. 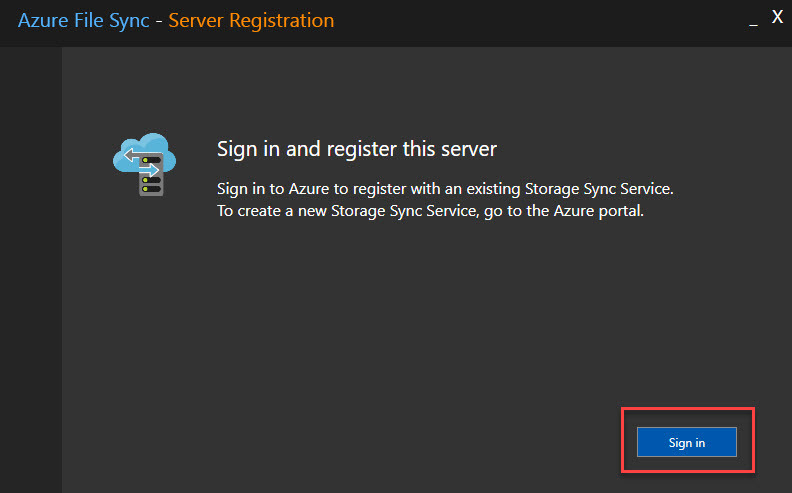 StorageSync.sys – This component is responsible for tiering files to Azure files. Cloud tiering is additional feature of Azure File Sync. It can use with not frequently used files greater than 64Kb. When this enabled, local file replaced with url to files in Azure file share. When user access it, in background it recalls the file from Azure file share. End user will not have any difference experience as it all happens in back end. 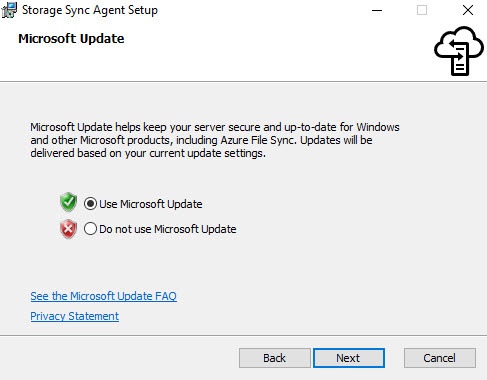 This agent is only supported in Windows server 2012 R2 / 2016 standard and datacenter versions only. It is not supported on core version either. Sync group defines the boundaries of sync job. A sync group includes cloud endpoint and server end point. 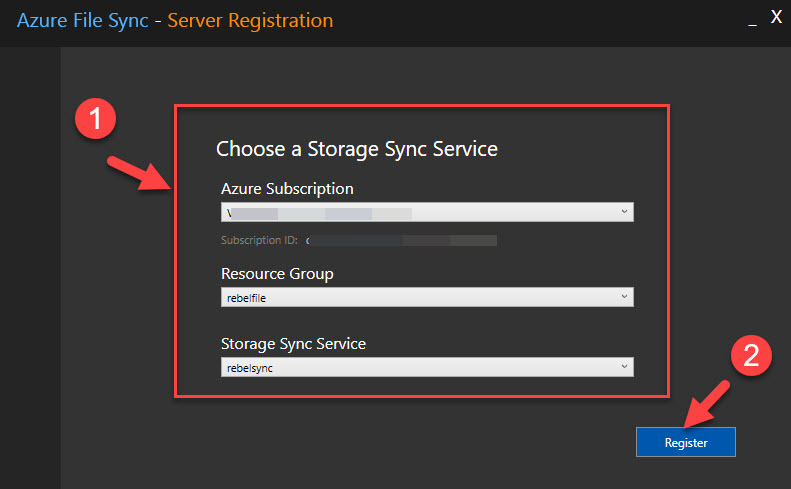 Storage sync service can have multiple sync group. Cloud endpoint represent an Azure file share. 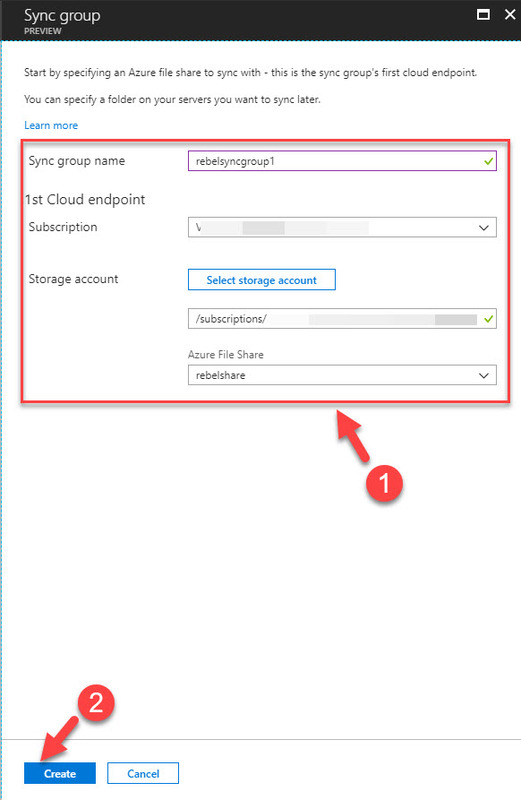 One cloud endpoint can only have one file share which means one Azure file share responsible for one sync group. Server endpoint represent the local server directory which will cache files from Azure file share. A one server can hold multiple server endpoints but one endpoint can’t be part of multiple sync groups. If it’s still added, it will merge with the files belongs to other endpoints in same sync group. Registered server represents the trust relationship between on-premise server and storage sync service. It is one-to-one connection. However, one storage sync service can have many servers registered with it. Now we know the component and how each component involves in sync operation between Azure file share and on-premises server. Next step is to get it configured. Azure file sync preview feature is only supported in Australia East, Canada Central, East US, Southeast Asia, UK South, West Europe, West US regions. There for azure file share also need to be in same regions. For this demo I have created a file share called “rebelshare”. It is associated with westus region. 3) In new window type name for sync service and select relevant resource group for it. if required can create new resource group. once you fill in info, click on create. 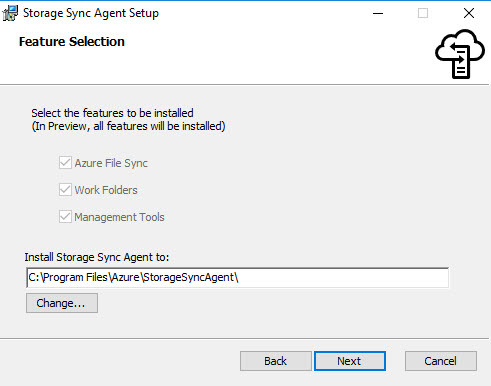 Next step in configuration is to install azure file sync agent in on-premises server. 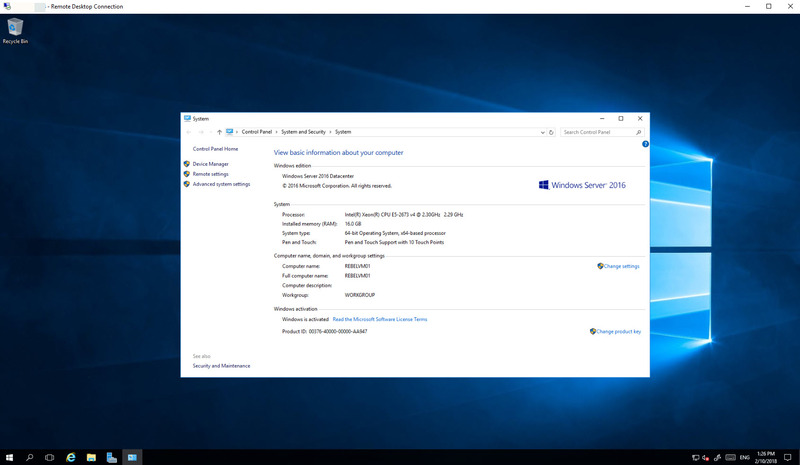 In this demo I am using server which running windows server 2016 datacenter edition. 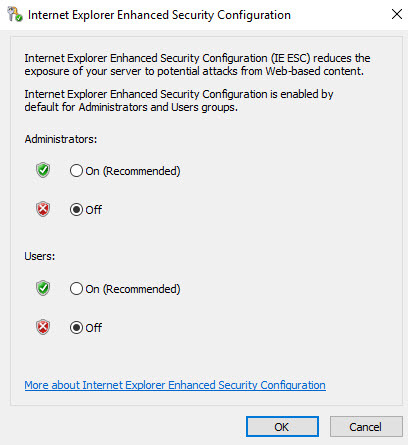 • Log in to server and disabled Internet Explorer Enhanced Security Configuration for administrators and users. This can re-enable after installation. Once download is completed, double click to start the installation. In initial page, click Next to continue. In next page, accept the license agreement and click on Next. After that in next window we can select the path for installation. In next window it asks in future how you need to update the agent version. It can be done using windows update. In next window, keep default settings and click on Install to begin installation. 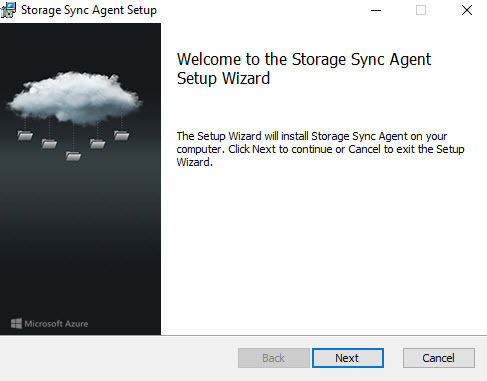 Once installation is completed, it opens up Azure File Sync agent wizard. First step is to register the server. in window click on Sign in to start the process. 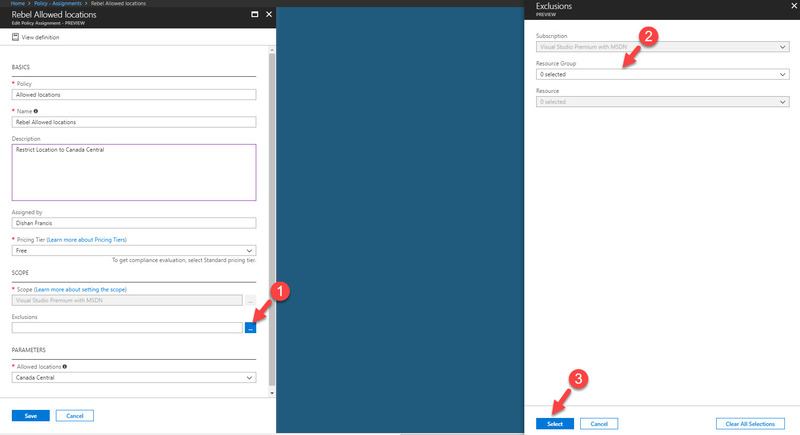 Then sign in using your Azure global administrator account. Then it will ask again for login, once it is done it will complete the registration process. Next step of the process is to create sync group. to do that. 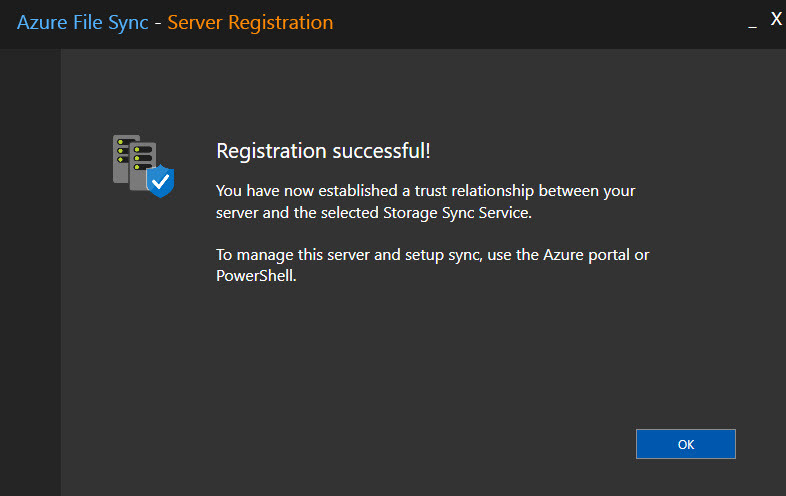 3) In Storage Sync Services page click on the Storage Sync Service we created on earlier step. 4) In new window click on Sync Group icon. 6) Once group is added, click on the new group. 7) In new window, click on add server endpoint option. 8) Then in new window select the registered server from the list and then define folder path for local cache copy. In my demo I am using E:\share path. I also enable cloud tiering feature. Once info is in click on create. 9) After initial sync we can see same files in two endpoints. 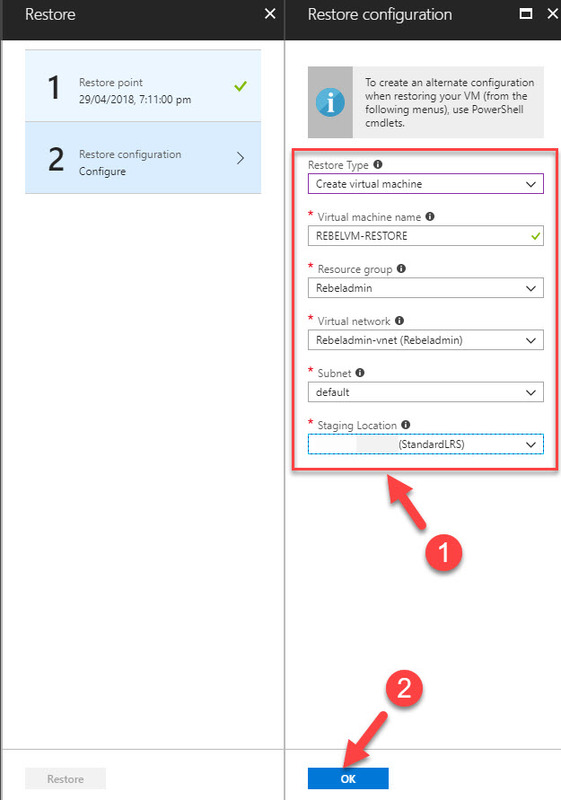 How to re-enable Network Interface in Azure VM? In Hyper-V or VMware virtualization environment, Enable/Disable NIC in a VM is not a big deal. Even if you do not have NIC or valid IP configure, administrators still can connect to VM as it does have “Console” access. Few weeks ago, I received an email from one of my regular blog readers. He accidently disabled NIC in azure vm and he lost RDP access to it. since there is no console access like other on-premises virtualization solution, of cause he was panicking. 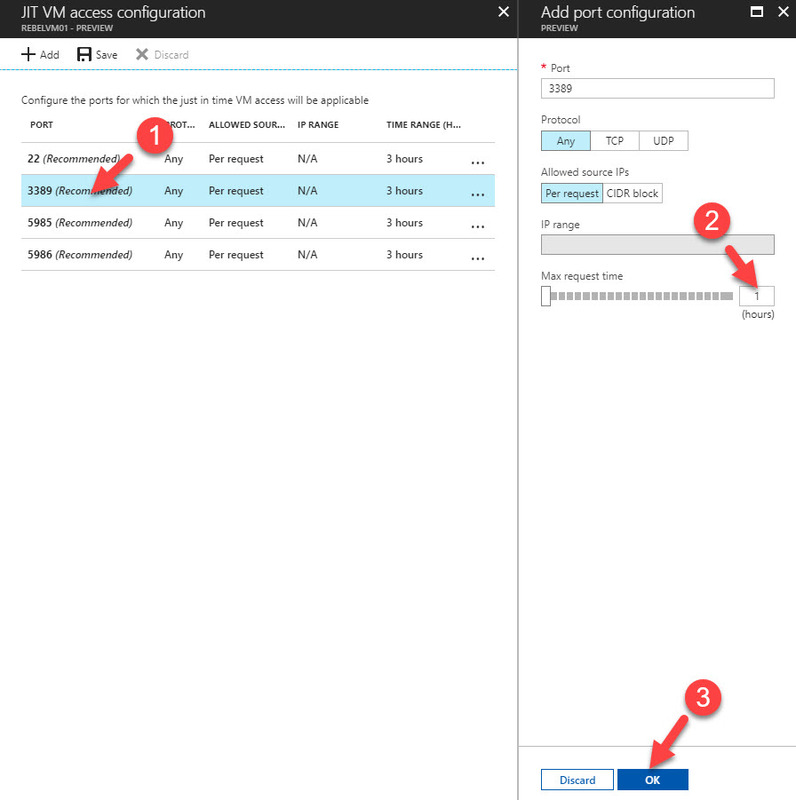 In this blog post I am going to share what you can do to re-enable your Azure VM NIC in such scenario. In my demo setup, I have an active azure VM running with 10.5.2.33 private IP address. I logged in to VM as administrator and disable the NIC. Now I need to regain the RDP access to server. 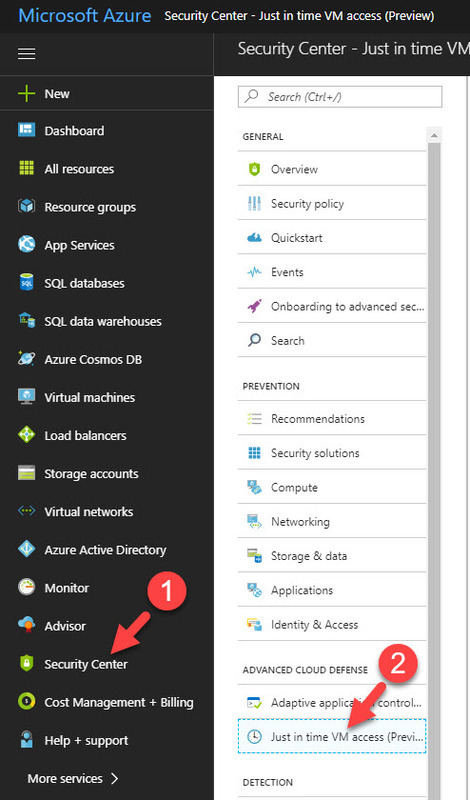 in order to do that, log in to Azure Portal as Global Administrator and click on Cloud Shell button in right hand top corner. When window load up makes sure you are using PowerShell option. In this command, -ResourceGroupName represent the resource group that VM belongs to. In my demo setup I only have one VM under that resource group. but if you have more VMs it can be hard to find the relevant info. In that case I recommend to use portal itself to view this info. In here, note down the network interface name, IP address and allocation method you using. 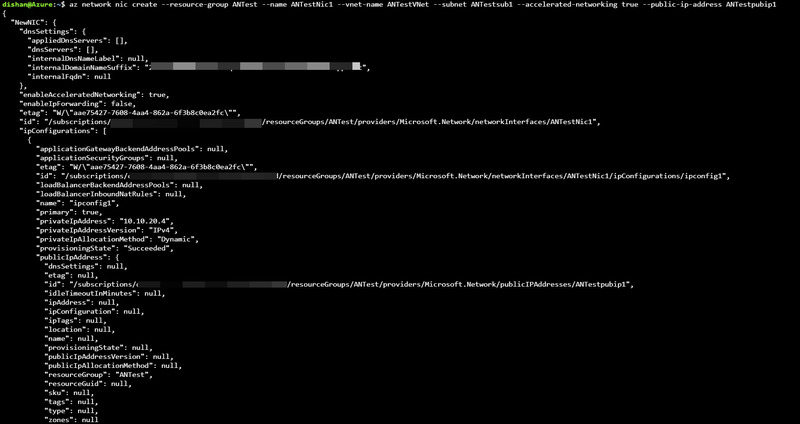 $Nic = Get-AzureRmNetworkInterface -ResourceGroupName "REBELADMIN-DEMO" -Name "rebeladmin-vm1123"
In above commands, rebeladmin-vm1123 represent the network interface name. 10.5.2.34 is the new ip address for the network interface. PrivateIpAllocationMethod define the ip allocation method. 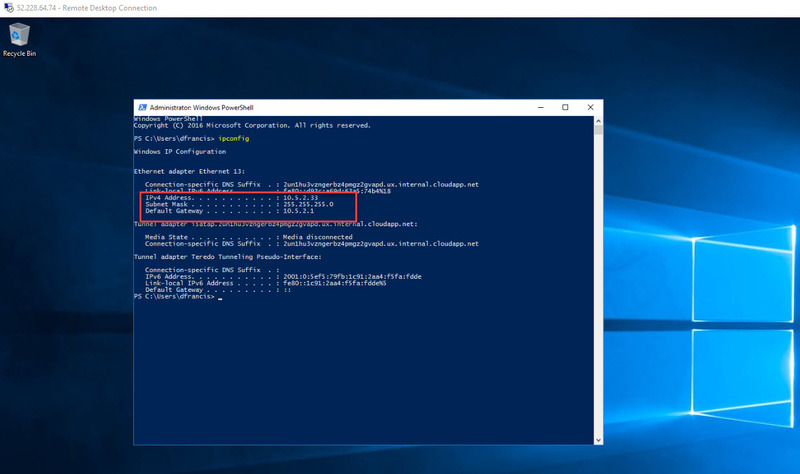 Set-AzureRmNetworkInterface cmdlet sets the network interface configuration. Great!! Now I got my RDP access back with new IP address. $Nic2 = Get-AzureRmNetworkInterface -ResourceGroupName "REBELADMIN-DEMO" -Name "rebeladmin-vm1123"
Once it is applied, I can access server via RDP and now it has same private IP address it had. If you using dynamic IP allocation method, you need to make it static, then change the ip and go back to dynamic mode. In most common scenarios hackers targets open ports in servers to gain access. It can be web server port, RDP ports, SQL ports etc. If genuine users also use same ports to access the system it’s hard to keep these ports closed. There are other methods such as firewalls that we can use to secure the access but it will still keep the ports open. when it comes to public clouds, its increase your infrastructure’s public facing part. Its clients, administrators may access services over the internet mostly. In that case it will give more time and room for attackers to target open ports. 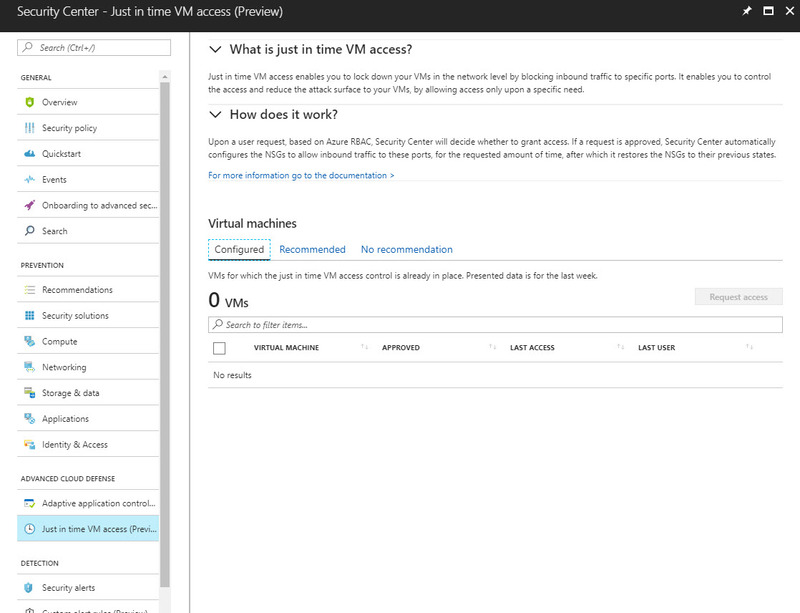 Azure Just-in-Time VM Access is a great option to control this. As an example, if engineers need to do work in their VM’s mostly they RDP in to the system. Let’s assume they work 1 hour per day on servers. so, keeping port open for 24 hours not giving any benefits rather than risk. 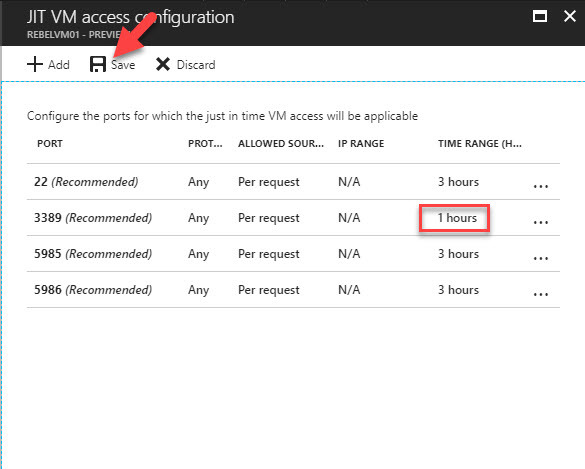 Using Just-in-Time VM Access we can limit the time it keeps RDP ports open. 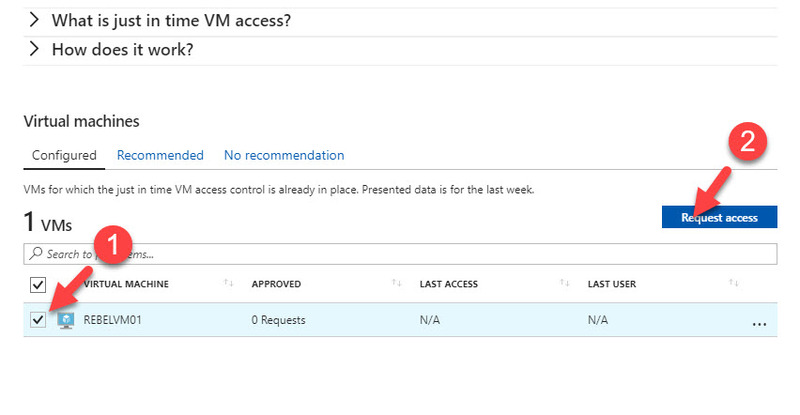 When this feature used with VM, upon access request to a protected port, it will first check if the user have access permission to it using Azure Role based access control (RBAC). If it all good, then NSG automatically configure to allow access with the time you specified. Once it reached the allowed time limit, NSG will automatically revert configuration in to original state. This feature is still on preview but it is not too early to check its capabilities. 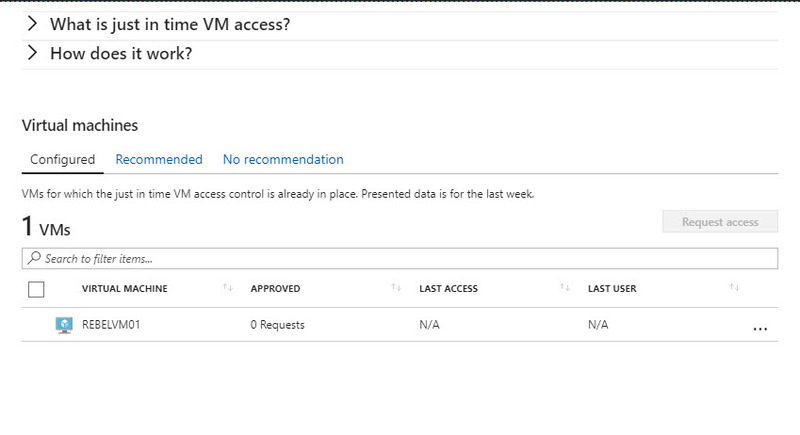 Also, this feature is only can use with VMs created using Azure Resource Manager (ARM). 1. Log in to Azure Portal using Global Administrator account. 3. Then it will load the default page. 4. Click on Recommended Tab. It will list down the VMs you have. 5. In order to enable JIT access, put a tick on the VM you like to protect and then click on Enable JIT on button. if need you can do it for multiple VMs in same time. 6. Then it lists down the default ports protected with JIT access. 7. We still can adjust settings for these services. 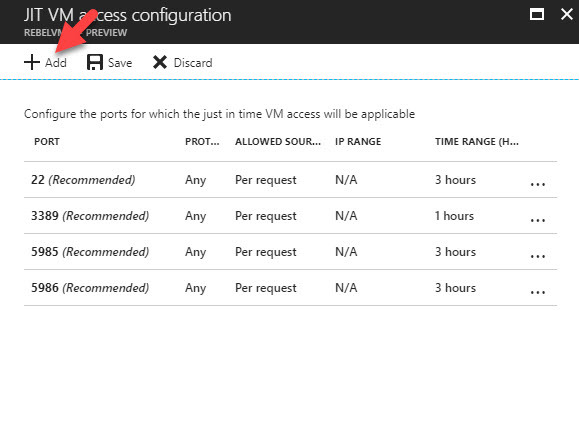 As an example, I need to limit port 3389 (RDP) port Max request time to 1 hour. By default, it is 3 hours. In order to do that click on rule for 3389 and change Max request time value to 1 hour. To apply changes, click on OK at the end. 8. In next window we can see the new value, click on Save to save the config. 9. If need we also can add our own ports to protection. Let’s assume we need to protect port 8080 access. To do that click on Add button in access configuration page. 11. Then click on Save to save the config. 12. After that, once we go to feature home page we can see the protected VM under Configured tab. 13. If need to edit the current configuration it can do using Edit option as below. 14. Now configuration is done. Let’s test it out. According to my configuration I have RDP port protected. 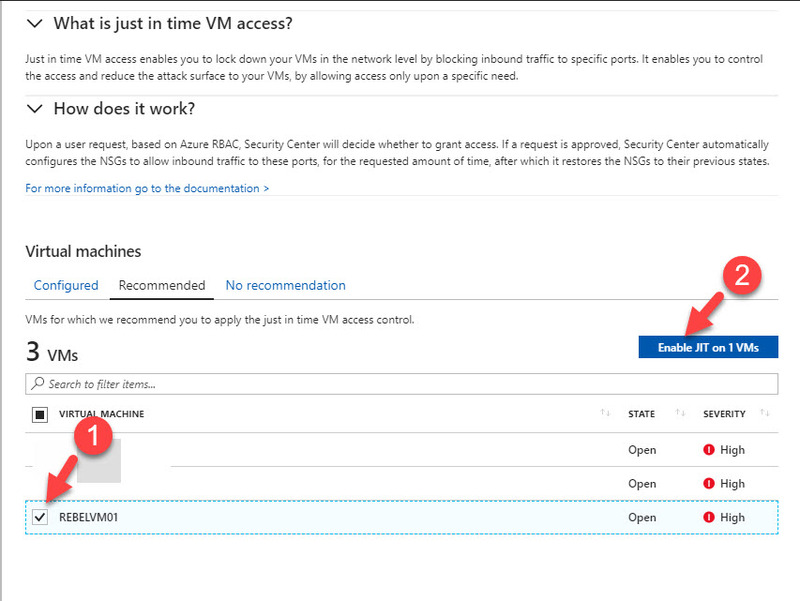 To request access, select the VM with tick box and then click on request access option. 15. In next window, I am only going to request access to RDP port. To do that select the correct rule and click on On tab under toggle. Then click on Open Ports button. 16. Then in the feature home page we can see it got 1 approved requests. 17. After configuration yes, I can access the server via RDP for 1 hour. 18. After one hour, I can’t initiate another new RDP connection. Using Activity log we can view logs related to past activities. This marks the end of this blog post. Hope now you have better understanding what is JIT VM access and how to use it. If you have any questions feel free to contact me on rebeladm@live.com also follow me on twitter @rebeladm to get updates about new blog posts. 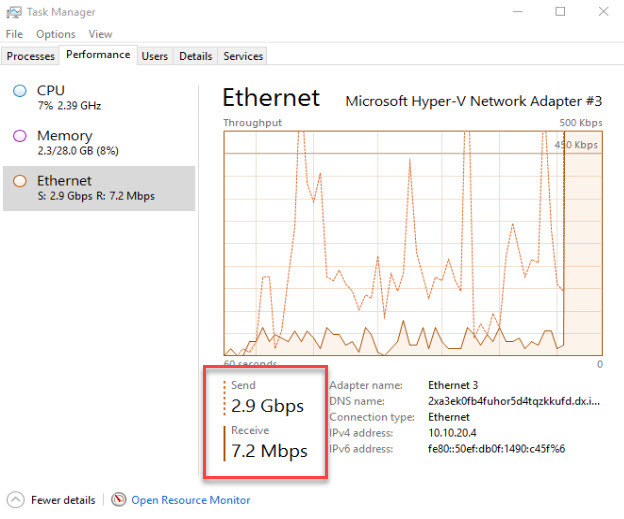 In my previous post I have explained what is Azure Accelerated networking and how it works. 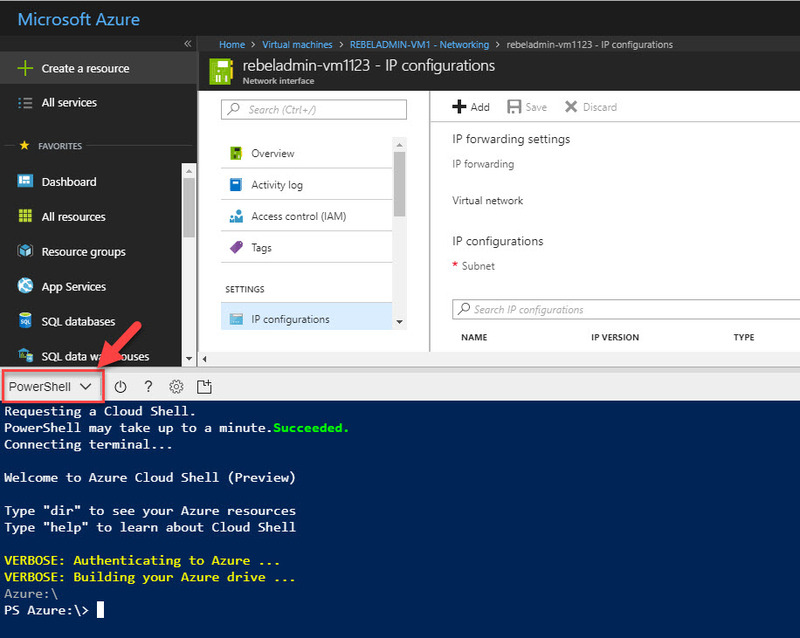 If you didn’t read it yet, you can do it using http://www.rebeladmin.com/2018/01/azure-accelerated-networking/ . In this post I am going to show how we can create VM with AN and verify its actions. 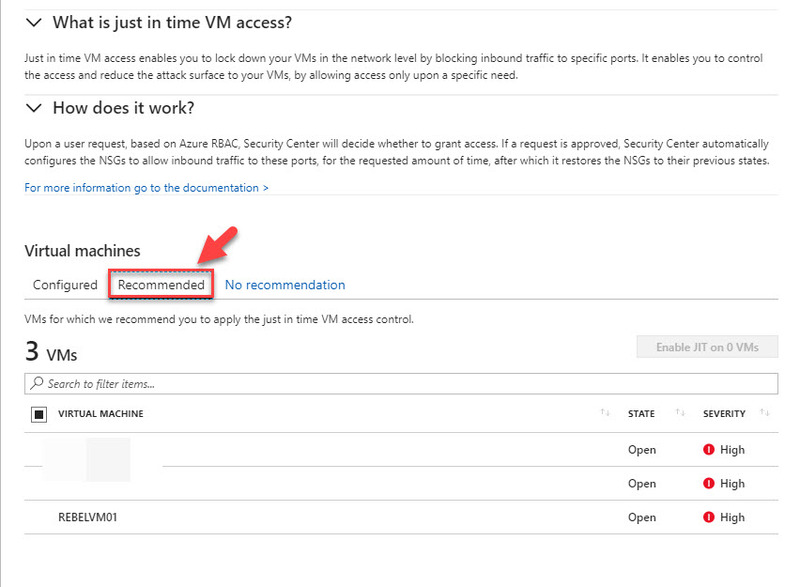 There are few limitations we need to aware before we use Azure Accelerated networking. 1. Can’t use with existing VMs – In order to use AN feature, Virtual machines must be created with Accelerated Networking enabled. This feature cannot enable in existing VMs. 2. A NIC with AN cannot attached to an existing VM – A NIC with AN enabled only can attached during the VM creation process. It is not possible to attach it to existing VM. 3. 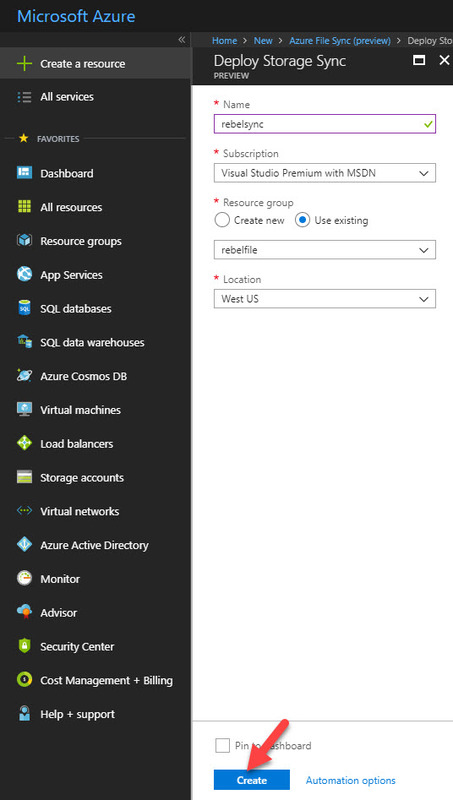 Azure Resource Manager only – This feature only can use with AR. It can’t use in classic portal. In my demo I am going to create new VM in new resource group with Azure Accelerated networking enable. Please note this feature can only enable using Azure CLI and Azure PowerShell. 1. As first step I am going to create new resource group called ANTest in westus region. 4. I like to access this vm from internet so I need a public ip attached to it. in above I am using dynamically assigned ip rather than static public ip. in above ANTestNic1 is the NIC name. –accelerated-networking true is the command to enable AN feature. 6. Next step is to create VM with this new NIC attached. Please note there are only some OS and VM templates support this AN feature. So, make sure you select the correct size. if you use unsupported template, you can’t change enable AN by just changing the template. 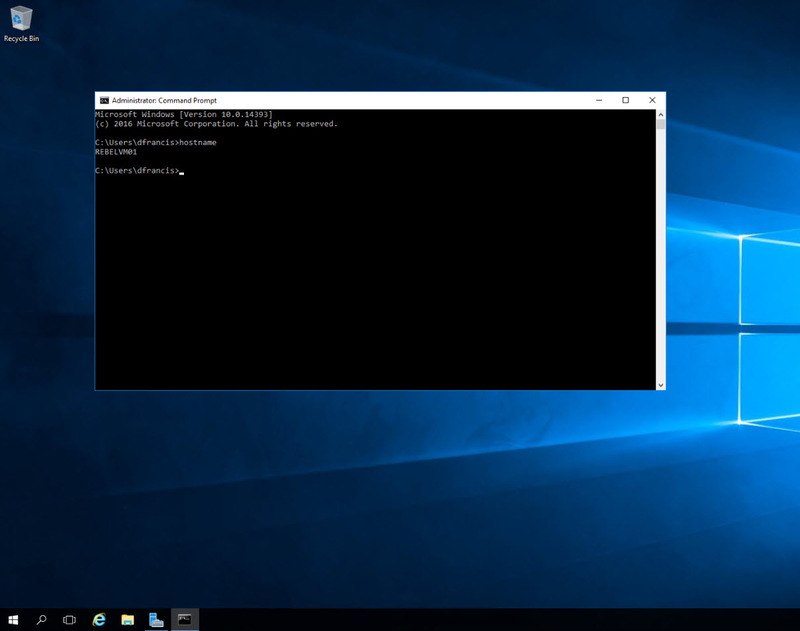 In my demo I am creating windows server 2016 server with Standard_DS4_v2 vm template. once it is completed we can log in to VM and verify. 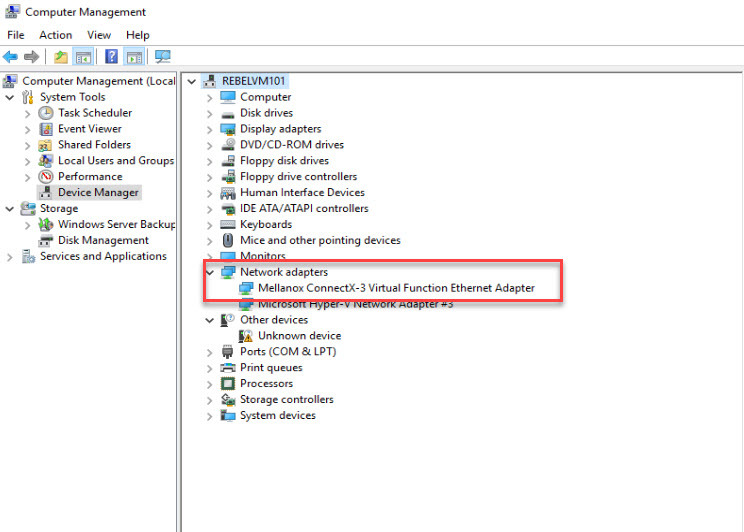 Once this feature enabled you will be able to see Mellanox ConnectX-3 Virtual Function Ethernet Adapter in device manager. Let’s see how it affecting performance. 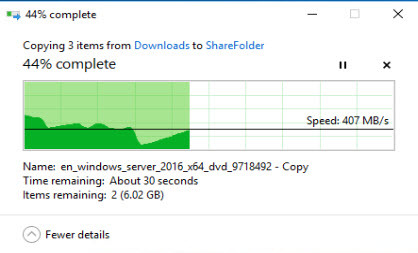 I do have 2 VM created using old method and I am transferring a folder with 10Gb data between them. So, let’s see how the performance looks like. 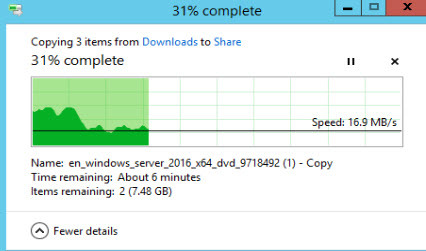 And when I do transfer same file between 2 VM with AN enabled I get following performance.